"Just a note of thank you. I bought Casino Fatale Expanded for my Halloween Party on Sunday and oh my god it was brilliant. I've never hosted or been to a murder mystery party before so was slightly apprehensive about how it would all work out but I needn't have worried the night went brilliantly absolutely everyone loved it and they can't stop talking about it, I made a slight change and set it in the 1920s I hope you don't mind. I am already being pestered about when I am going to have my next one. You've created a Murder Mystery Monster!" "Just to let you know what a fab time we had playing Casino Fatale this weekend – everyone was absolutely brilliant in their characters and the outfits donned by everyone were hysterical. As the host I was a little concerned how things would run, but I needn't have been, it all ran really well. Will be definitely getting another one of your games!" "Everybody, 30 players had a great time with Casino Fatale, so did I… The game is really great, and people loved to play them all. No one had ever heard about or played any murder and mystery game before. Now people are asking me when will be the next one… [Paulo translated the game into Portuguese for his guests!]" "We used Casino Fatale as the evening entertainment for our staff holiday party. The game was played by 27 people, plus 2 hosts. All participants had to be 'in character' from the moment they walked into the party. Some of them became their characters a couple of days early! From all accounts, a good time was had by all. Takes a bit of organization – but it is well worth it. We did embellish with some real props – dollar store guns and knives (nail polish makes wonderful blood on a knife…); a bandage box became a first aid kit; a small vial filled with beads became poison; a 'diamond' pendant and an 'emerald' bracelet. A fun-filled evening of murder and intrigue! Thank you." "We ran Casino Fatale for a Christmas party, and our guests are still talking about it a few months on!!" "We had a great time with Casino Fatale! Had a load of coworkers and some friends visiting from different parts of the country. I hosted as the barman and dealt drinks while the characters milled about. I also modified the rules to let people shoot from a distance (shooter tells host rock/paper/scissors in advance and the host asks the victim their response). Everyone throughly enjoyed the added intrigue! Thanks Freeform Games!" "Last night we played Casino Fatale. It was so much fun. The plots were great and well mixed together. Everyone got so confused! Was great fun thankyou once again :)"
"I just wanted to take a minute to thank your company for the quality products you sell. I recently purchased Casino Fatale for a Bond themed 30th Birthday Party and it was a HUGE success. Everyone who came said that it was the best party they had ever been to. Thank you for making it a success." "Casino Fatale Expanded was amazing. Best party ever!!!" 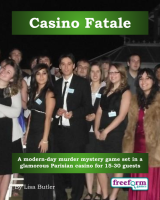 Casino Fatale is a dinner party murder mystery game for 15 to 30 guests and one or two hosts – download the free introductory pdf file. New edition – we've prepared a special new edition of Casino Fatale, which includes the former expansion pack. Join us at an exclusive Parisian casino for an evening of espionage, crime, intrigue and murder. You will be in the middle of the action and it will be up to you to wheel and deal with the other guests. Can you achieve your goals, keep your secrets hidden and survive Casino Fatale? It's up to you. On the banks of the River Seine in Paris is the Hotel D'Etoile, with a casino named the Casino Fatale. Rumour has it that the casino is connected to the mysterious underworld character 'Mr X'. No one seems to know exactly who the elusive Mr X is, or what he looks like – and there are many people who would love to know. Among those trying to find Mr X are Interpol, the local police, the local organized crime family, and the agents of several countries in which Mr X is believed to operate. Tonight, however, a charity auction is being held at Casino Fatale and it has drawn all sorts to the casino – playboys, starlets, maybe even a jewel thief… Who will you play? Why should you be very careful with your jewellery? …and is the casino really up for sale? Casino Fatale lasts for about four hours and is suited to an evening. It is often played over a meal – a finger buffet if possible to allow guests to circulate and talk in private. "Our Casino Fatale party was great – thanks so much for your help! This was the first murder mystery I've hosted so I was anxious that it go well – anyway, fantastic night, definitely going to do another one!" The free introductory pdf file contains an introduction to the game, a cast list of all the characters, and a copy of the Paris News – plus details of how to buy the game. Casino Fatale is unlike many murder mystery games. Although the game starts with a murder, most of the characters have more important things to do than to investigate it. And the killing may not be over – it is unlikely that everyone will survive the remainder of the evening! "I played Way out West at a friend's birthday. I thought it would be "the usual." It wasn't. Interactive, layered, and fun, I was inspired to host my own: Casino Fatale. I liked this game better, because the Casino Fatale characters weren't clearly good/bad – they were difficult to pin down/categorize, making the game more intriguing." On the evening of the game the guests are met by the organizer, the Casino Events Manager. They then receive their detailed backgrounds – including dark secrets, objectives and casino gambling chips. When everyone has arrived the host announces that the glittering evening and charity auction will now proceed. The fun then begins as everyone questions, bribes and blackmails each other. As the evening progresses they may even try to murder one another! Depending on what the players choose to do, there are several different possible endings, but finally everyone finds out how they did, and what secrets everyone else was concealing. Casino Fatale costs £30.00 (GB pounds) or US $49.99. You can buy it in either currency, from anywhere in the world, as you prefer. The price will be converted back into your own currency for you, at today's exchange rate. We offer a Cast Iron Guarantee on all our murder mystery games. If you're not completely satisfied with Casino Fatale then please let us know within 30 days and we will refund you. See our full terms and conditions here.